C/ Progreso, 1, 07820 San Antonio, Spanje. 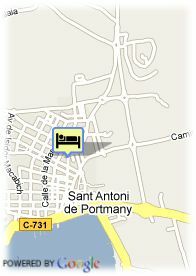 Sa Clau Apartments are located in the centre of San Antonio, on the famous Paseo de las Fuentes. The bus stop and the taxi station are right in front of the building. West End and the clubs of San Antonio are just few minutes walking. Studios with dining room, kitchen,2 sofas, refrigerator, air conditioning and full equiped bathroom.Reception 24 hours. Rent-a-car and motorcycles service. Cleaning service. It is a great option for young people.